Preacher: Larry W. Dean (30), David King (3), David Rasmussen (1), Revival (1). Series: Visiting Missionary (1), Christmas (1), Miscellaneous (2), The Theme of Christ's Ministry (1), Father's Day Service (1), Great Sayings in the Gospels (9), Convocation of Prayer 2012 (3), Prayer (13), Featured (4). Service: Sunday Morning (31), Sunday Evening (3), Midweek Meeting (1). (Part of the Visiting Missionary series). Preached by David Rasmussen on September 9, 2012 (Sunday Morning). Preached by Larry W. Dean on September 2, 2012 (Sunday Morning). 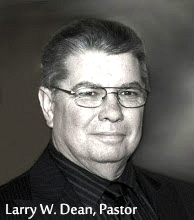 Preached by Larry W. Dean on August 19, 2012 (Sunday Morning). How much evidence is enough? Preached by Larry W. Dean on August 12, 2012 (Sunday Morning). (Part of the Great Sayings in the Gospels series). Preached by Larry W. Dean on August 5, 2012 (Sunday Morning). Preached by Larry W. Dean on July 29, 2012 (Sunday Morning). Preached by Larry W. Dean on July 22, 2012 (Sunday Morning). Preached by Larry W. Dean on July 15, 2012 (Sunday Morning). Preached by Larry W. Dean on July 8, 2012 (Sunday Morning). (Part of the The Theme of Christ's Ministry series). Preached by Larry W. Dean on July 1, 2012 (Sunday Morning).